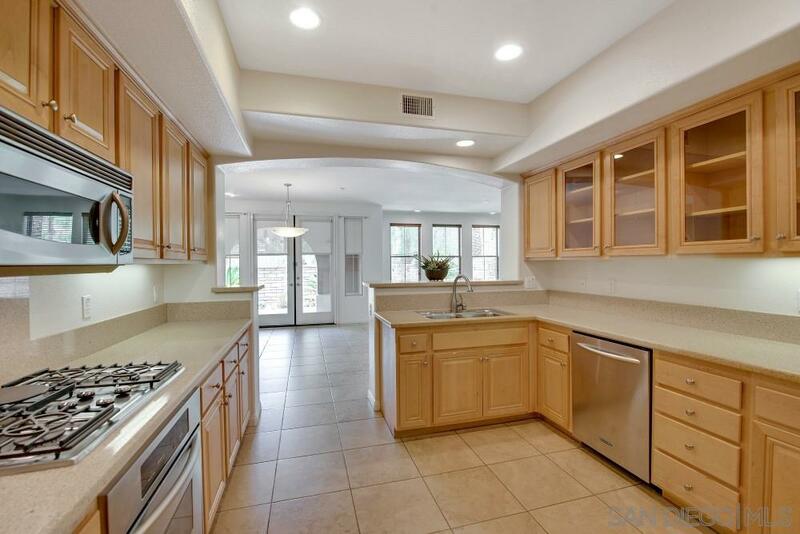 Desirable single story in the gated community of Escala feels like a detached home. The spacious wrap around patio offers plenty of room for relaxing or entertaining. Private location with no homes behind. Nicely upgraded throughout with Maple cabinets, stainless steel appliances, wood & tile flooring. Freshly painted interior, walk-in closet in master, laundry room w/walk-in pantry. Enjoy resort style amenities including pool, spa, tennis courts, fitness center, dog park, club house, and walking trails., This lot one was one of the Premium lots when built because of having no homes behind. The garage floor and backyard patio were just given a fresh coat of epoxy paint, and a new ceiling fan and bathroom lights have been installed since the photos were taken. This wonderful upscale gated community of Escala is centrally located in Mission Valley with great freeway access, and close to restaurants, shopping and more.